Exhibits and Sponsorships: Exhibits are an integral part of the conference experience. From the perspective of the conference owners, it provides additional educational opportunities and it can provide additional revenue. From the exhibitor side it provides an opportunity to share information with potential customers. 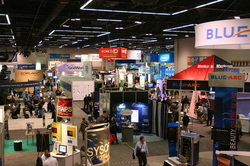 CONCENTRA Conference Management Services has experience in managing the simple bookstore to the large exhibit hall. We can help make this element of your conference a win for you, for the attendees, and for the exhibitor. Contact CONCENTRA Conference Management Services for more information.